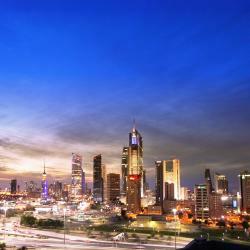 Booking.com : luxury hotels in , Kuwait. Booking.com loves Kuwait! How about you? Finding a great luxury hotel is easy with Booking.com. More choices, more destinations. With five restaurants and lounges, Four Seasons Hotel Kuwait at Burj Alshaya offers a complete experience where guests can sleep, dine and enjoy all the facilities on offer. There is an indoor and an outdoor pool, and guests can enjoy the free WiFi throughout the hotel. This 5-star hotel boasts with 295 well-appointed guest rooms and suites featuring stylish décor and luxurious amenities. Standard features include flat-screen TV, a seating area and a work desk. Tea/coffee making facilities and minibar are also offered. Located in the Messilah beach district, this 5-star hotel offers modern accommodation with free Wi-Fi in the heart of Kuwait. It features 8 dining outlets along with an outdoor pool, gym and spa. With a contemporary décor and electric curtains, all air-conditioned units come with a flat-screen TV, minibar, tea/coffee making facilities, in-room safe and private bathroom. The apartments have a fully equipped kitchen and a living room. Symphony Style Hotel Kuwait offers 175 rooms and suites, all of which have stunning views of the Arabian Gulf. The rooms continue the palette of gold, turquoise and beige seen throughout the property and are accented with bold, emphatic patterning. Combining form and function, the accommodation has been carefully designed to meet the needs of today’s modern travelers with linens chosen from the Italian designer home range of Missoni fashion house. Each guest room offers unparalleled guests’ amenities, from the large bathroom that showcases the Italian designs with its finest bathrobes and towels, to Bang & Olufsen LCD TV with its Ipod docks, in room espresso machines & complimentary mini-bar. The hotel provides an extensive variety of facilities including 179 luxurious Room/Suites, conference and meeting facilities, in addition to a world wide of dining experience and culinary delights from the Far East to Europe with assorted renowned restaurants and coffee shops; includes Palmarie International open buffet restaurant, Tagine Moroccan cafe & restaurant and Al-Muhalab traditional seafood restaurant, to suit all tastes. Only a 5-minute drive from Kuwait International Airport, Crowne Plaza Kuwait Al Thuraya City offers free WiFi throughout the entire property. It features an Aquatonic Pool and a fitness centre. Grand Avenue Mall and 360 Mall are just a 5 minute drive from the property. Not just luxury hotels – we have these places to stay too!